It may have taken an entire day to get the pictures taken, but we did it (she is very chatty, good-natured, and actually has a great eye, so it’s not so bad) and now have the perfect menu for all of your plant-based, body-loving Bastille Day needs. It’s actually not a complicated menu if you don’t intend to take how-to pictures or have a curious baby velcro’d to you while you cook. We shot this last week and enjoyed it that night with the addition of a little bit of rosé and cheers’d to the beautiful weather and the Tour de France (it wasn’t Bastille Day yet and those riders work hard!). 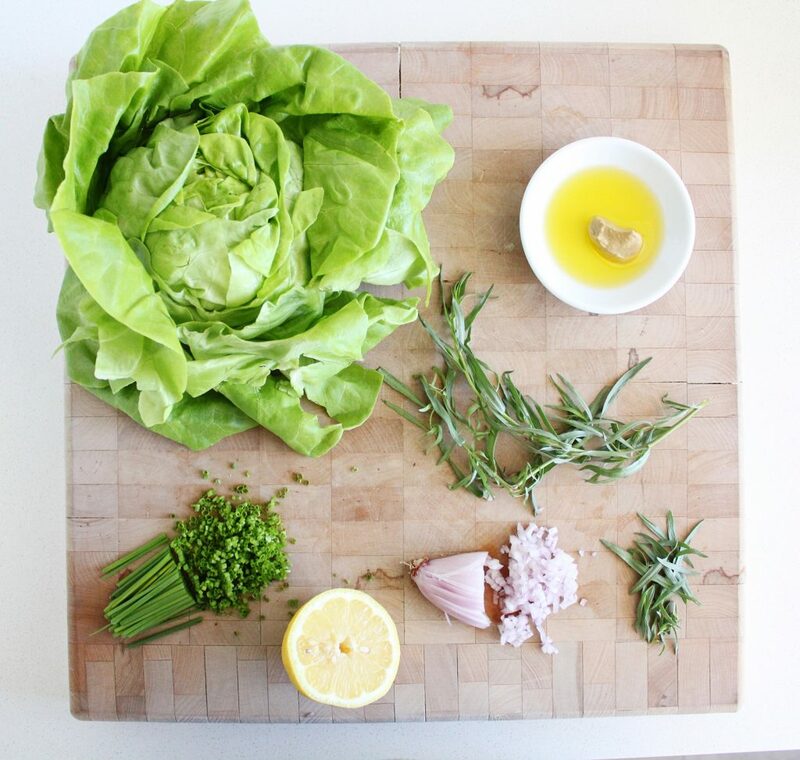 One of my favourite French dishes is the simple butter lettuce salad. 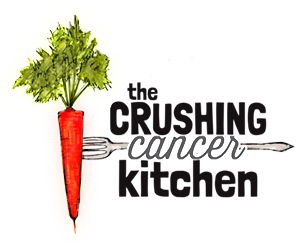 I haven’t changed it, it is exactly as you would see it on a menu in France (ok, I used raw apple cider vinegar and lemon juice in place of white wine vinegar, but I didn’t sub in Napa cabbage or add turmeric or anything). Butter lettuce isn’t out of this world on the nutrient-density scale of lettuces, but it’s not like it’s a bag of chips; it is still a vegetable, it is still a leafy green and maybe it would be nice to have a butter-y kiss from our greens, at least once a year, on a day that we tag along on a French celebration? 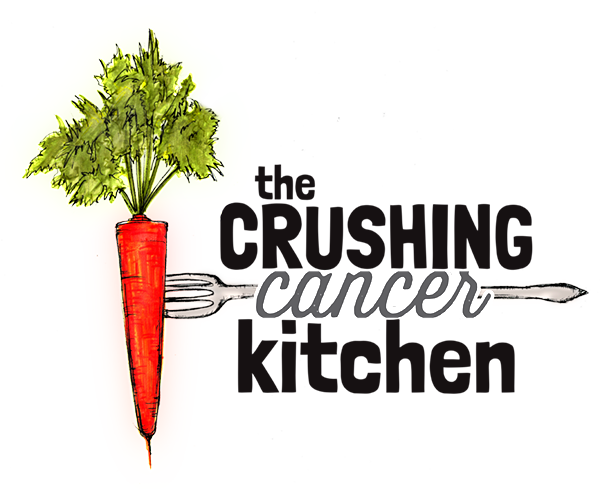 If you are a wiggly person or fall in love with this salad and want it every night, an easy way to up the nutritional benefits is to use leaf lettuce, preferably the red kind. This won’t change the flavour too much but you’ll get extra pigment power. 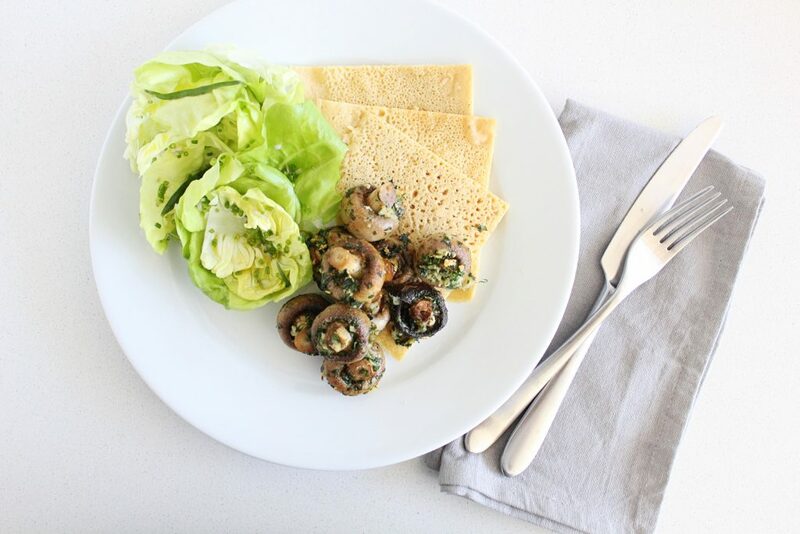 The plant-based escargots have been floating around in my brain for at least a year. 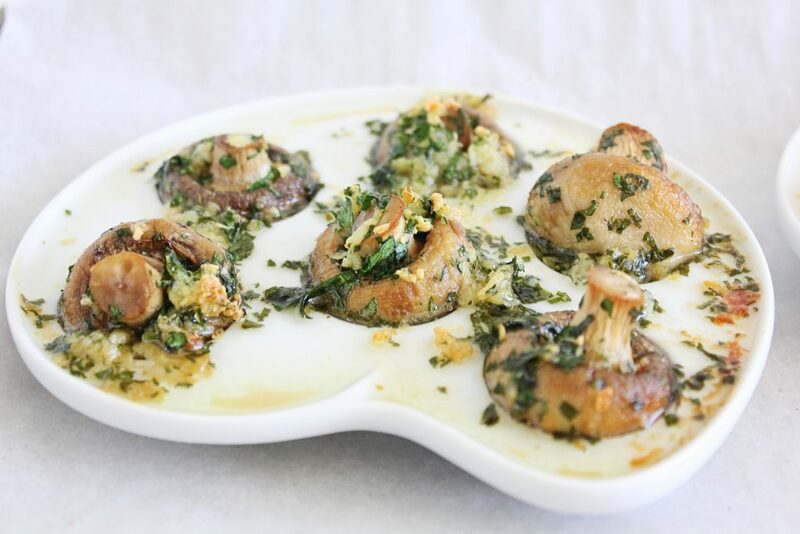 I love escargot in the way that I love other things that I would stop loving if I thought too much about. But it’s really all about the garlic butter (and bread) and not about the snails at all (seriously, who came up with this?). I thought about all of the weirdo ingredients that could resemble snails: chickpeas (protein, round), shitake mushrooms (a bit….wet? ), buckwheat (protein, sort of weird), but in the end, what I really wanted was for the dish to be just as enjoyable as the original. For that reason, we use white mushrooms; they don’t bring a ton of their own flavour, but enough to really say ‘don’t worry guys, these are definitely mushrooms’ and then let the garlic party start. 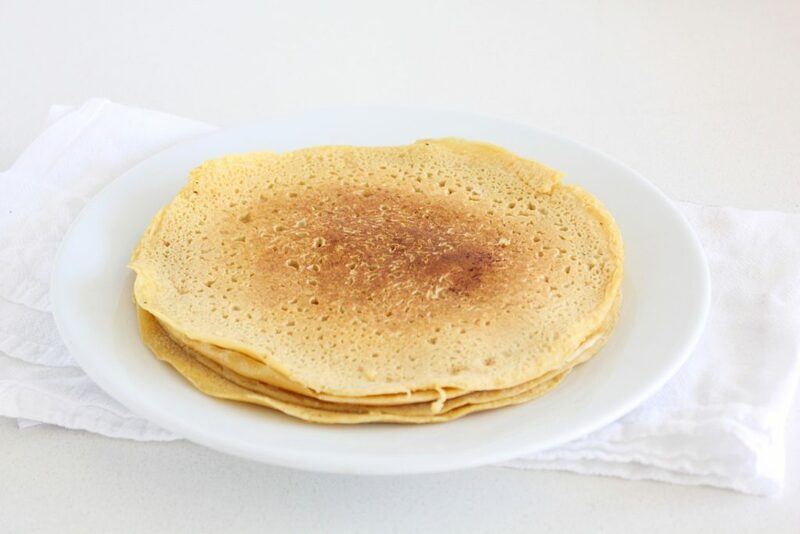 The chickpea pancakes are just a skinnier version of the French ‘Socca’. I struggled with something to serve with the escargot that could mop up the extra garlic, when baguette was, without question, made for it. The pancakes do a really good job though, they’re very easy to make (three ingredients), you can even make them ahead of time. 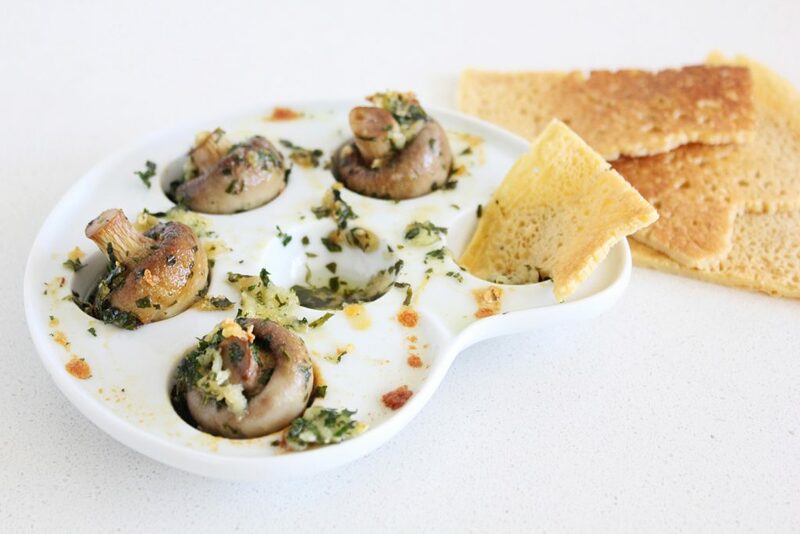 They also add protein to the meal (considering we are actually snail-free). Any extras are delicious topped with anything that would be good in a sandwich (or on Sweet Potato Toast). You guys, this meal was really good. And it wasn’t the rosé talking either (hibiscus kombucha would have been just as [almost as] good). The ‘escarfaux’, as my sister called it, is rich and fatty, but it’s all good quality extra virgin coconut oil. If you think this sounds terrible because it would taste like coconut, guess what? Garlic is waaaaay bossier than coconut and it totally wins out. This works for a ketogenic diet too, as long as you leave out the pancakes. 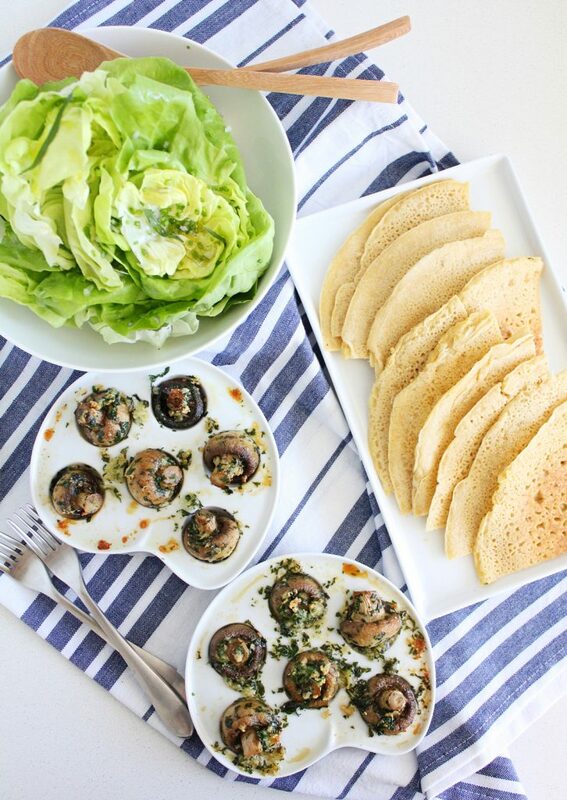 Don’t have fancy escargot dishes? (seriously who does? Why do I?) 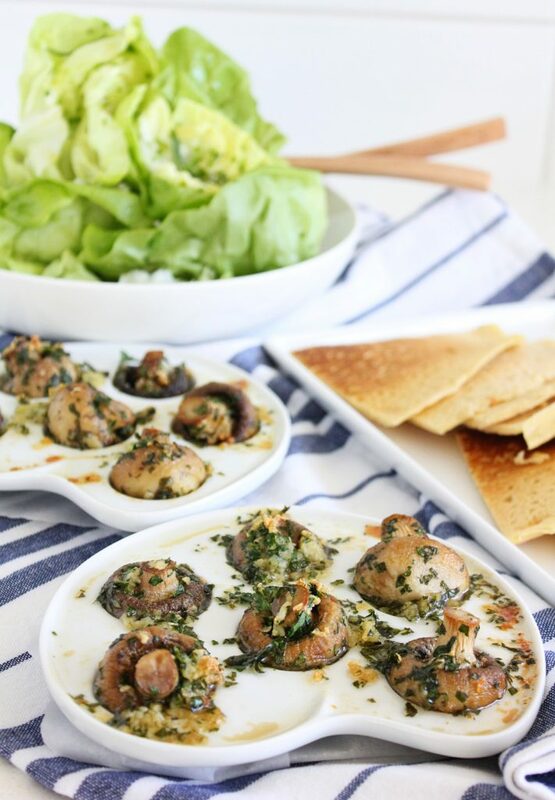 Put the mushrooms in little handfuls into ramekins and bake them that way. You can squish them in because they shrink as they cook. They just need a small dish so that they cook and stay immersed in the oil, garlic and juices. 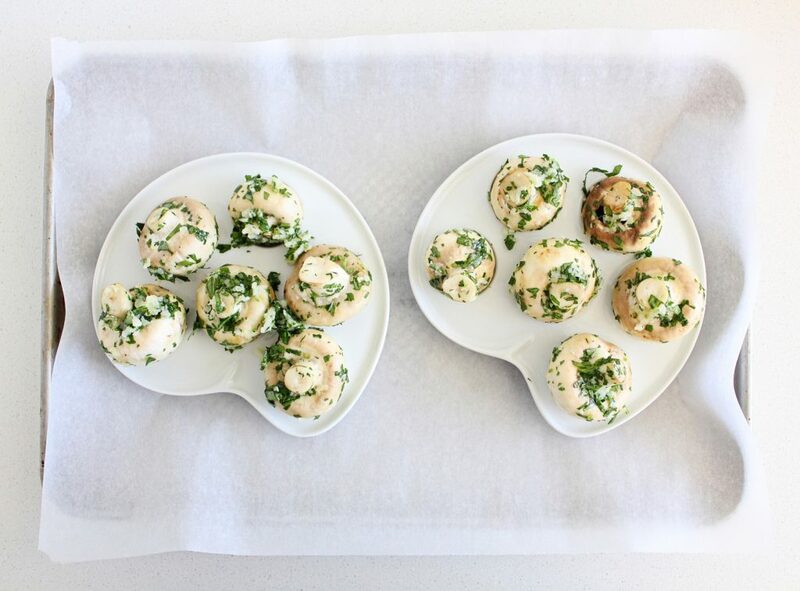 You could serve them in the ramekin or just pour the contents over the pancake, once cooked. Heat a 10 inch pan to medium/high, add a spoonful of coconut oil followed by enough batter to coat the bottom of the pan. 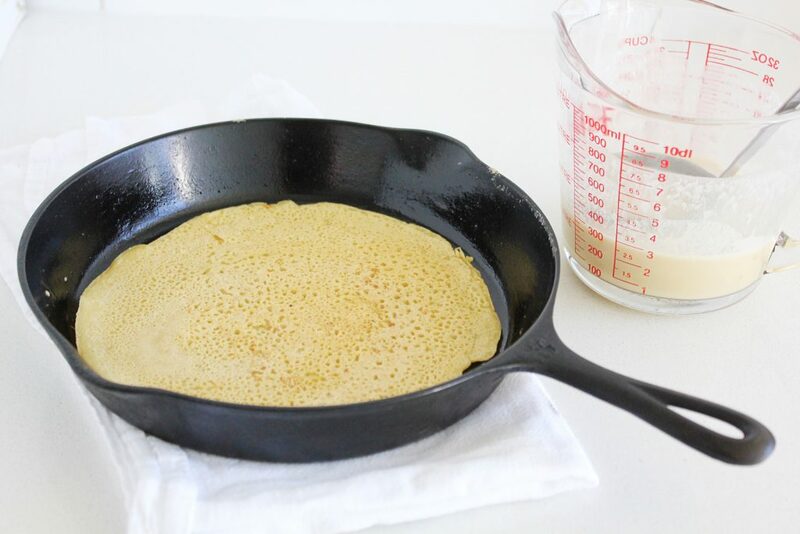 Cook until bubbles form then flip pancake and let it cook for another minute or so on the other side. Stack up and then re-heat before serving. Makes five 10 inch pancakes. In a small pot, melt the coconut oil and warm slightly with the garlic. 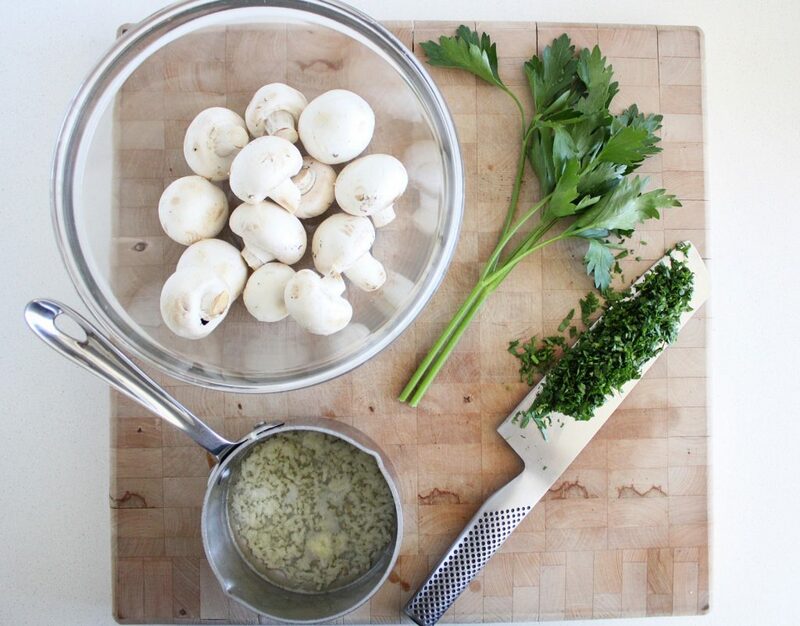 Toss the whole mushrooms in a bowl with the melted oil, garlic, parsley and sea(weed) salt. 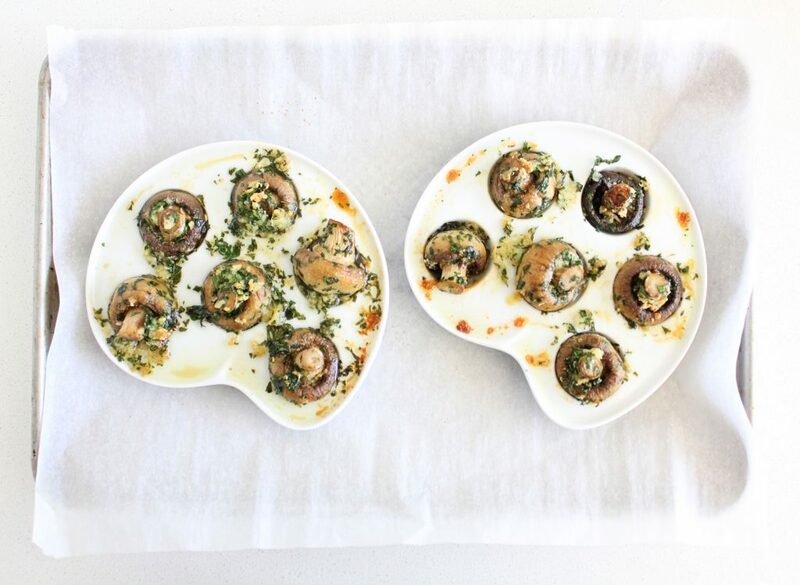 Put the mushrooms in escargot dishes or put 4-5 per individual ramekins. 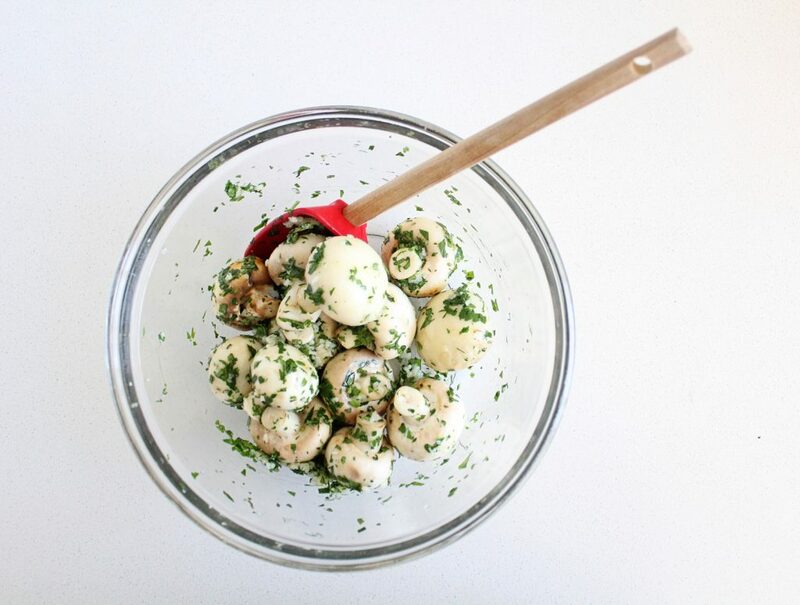 Scoop up any remaining garlic/oil/parsley mixture and put it on top of the mushrooms. Bake for 15 minutes, roll them over in their vessels and then bake for another 10-15 minutes or until slightly golden brown. Tear up the outer leaves of the butter lettuce and leave the inner ones whole, but separate them from the core. Wash and dry. Whisk the oil, vinegar, lemon juice, mustard and sea(weed) salt together. 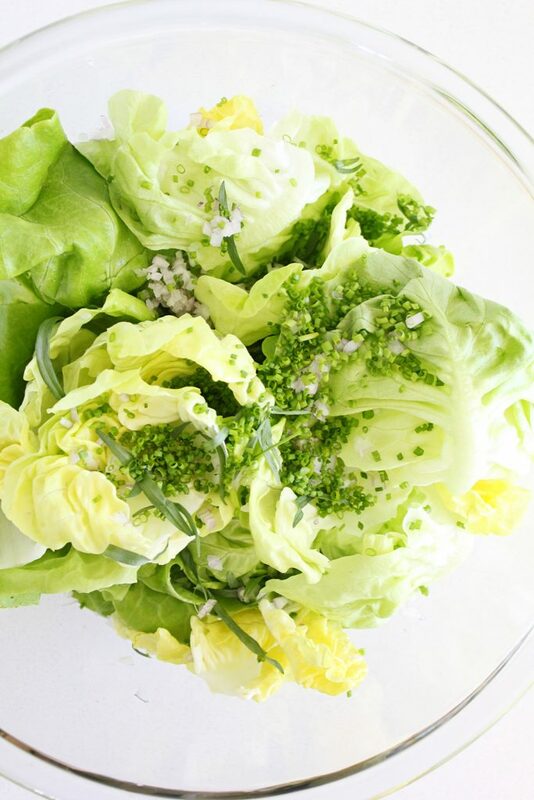 Toss together with the lettuce, chives and tarragon right before serving.